56 • October 2018 www.concreteproducts.com FINAL FORM READY MIXED In celebration of the company's 90th anniversary, Mokena, Ill.-head- quartered Ozinga Bros., Inc. delivered "90 Acts of Kindness" throughout the Chicagoland area during the Chicago Police Memorial Foundation's K9 for Cops kickoff. The annual public art installation featured hand-painted German Shepherd and Labrador sculptures, including Ozinga's Ozzie, displayed throughout the Magnificent Mile District the end of Sep- tember. During the event's opening, representatives from Ozinga delivered acts of kindness in the area, which included passing out gift cards, toys, and other branded Ozinga gear to bystanders. Following the kindness acts, company representatives headed to Comer Children's Memorial Hospital to deliver over 500 toys were donated by Ozinga employees in their inaugural "Christmas in July Toy Drive." One of Ozinga's iconic red-and-white-striped concrete mixers was also on site for patients to enjoy. Last winter, the Ozinga Merry Mixer ("Ozinga Merry Mixer: 20,000 LED lights, 2 speakers, 1 holiday playlist," Concrete Products, December 2017) brought joy to the children of Comer during the holiday season. "Acts of kindness come in all shapes and sizes," says Marty Ozinga IV, Ozinga president. "It can be something as unexpected as paying the bill for someone behind you in the drive-thru or giving children in the hospital some new toys to play with. The important thing is that we look for ways to make someone else's life better." Ozinga is no stranger to philanthropy. 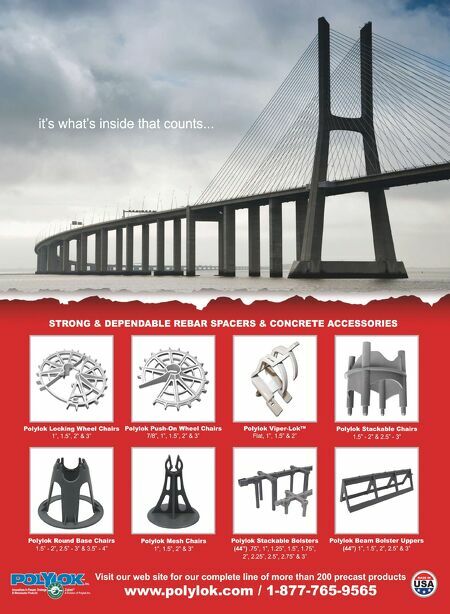 Through the Ozinga Foun- dation, the family-owned company supports many non-profits and organizations every year. 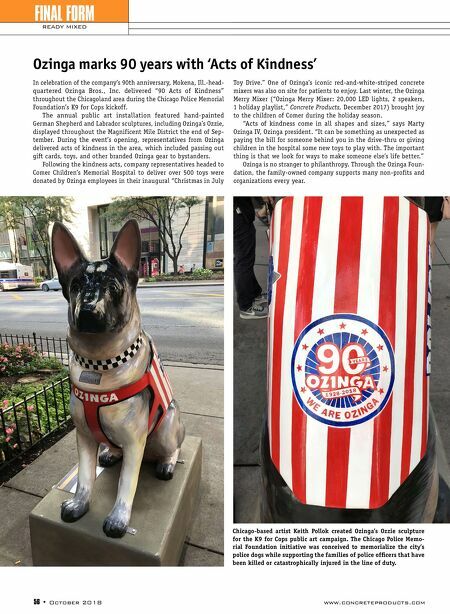 Ozinga marks 90 years with 'Acts of Kindness' Chicago-based artist Keith Pollok created Ozinga's Ozzie sculpture for the K9 for Cops public art campaign. The Chicago Police Memo- rial Foundation initiative was conceived to memorialize the city's police dogs while supporting the families of police officers that have been killed or catastrophically injured in the line of duty.